Last week, in honor of my friend Mel being in town, the girls and I attended a pizza class at Kitchen Conservatory, taught by the amazing Kirk Warner. As you might remember, I've taken a pizza class before, where we made traditional pizzas, but this class was different - this class was about "Grilled Pizza" and some of the toppings were anything but traditional. Other than Heather (who has taken a few KC classes with me before), none of the girls had been to a KC cooking class and I couldn't wait to introduce them to one of my favorite things to do (I think this was my 14th class!). We picked a great one too (although, they're all pretty great), Kirk was awesome and the food did not disappoint. Kirk started out by showing us how to make the dough - huge vats of dough that can be frozen, parbaked and stored, or made right away (well, right after it rises). The dough should be cut into 2 oz. portions, which are the perfect size for a personal pizza. For pizza that is going to be cooked on the grill, Kirk recommends a very very thin crust. So, our first job was to roll out the dough. Kasey and Heather were great at this. Then we began working on the toppings. Julie cut onions for her pizza. Kasey worked on making tomato chutney for her pizza. I made these spicy garlic-chili shrimp. And when the toppings were all ready, it was time to grill the dough. place dough on grill, let cook on both sides for a few minutes, remove from grill. Sheesh, why haven't I been grilling my pizza this whole time? Heather and Mel manned the grilled. On a side note, our cooking class was also a bit of a celebration, since we learned a few days before that Mel was cooking something besides pizza. The bun in her oven is 12 weeks young and due a few days before Christmas! I am so excited for them and can't wait to meet this kid. That is one lucky baby to have Mel and Eric as parents! Mel's colleague and her father were also taking the cooking class. Now I want to take my dad to a class too! After the dough was cooked for a few minutes, it was solid enough to hold toppings, so we headed back to the kitchen to prepare the pizzas. Since the pizza crusts are so thin, the toppings should be light and spread out to keep the pizza from being too heavy or not cooking throughout. The pizza I prepared was a spicy shrimp, asparagus and sun-dried tomatoes with goat cheese (below). YUM. Kasey and Heather's pizza was an Indian-inspired pizza with saag paneer and tomato chutney. Both went back on the grill to cook a little longer to heat the toppings and get the crust nice and crispy. The finished product was incredible. Julie and Mel prepared their pizza next. A light brushing of olive oil, followed by prosciutto, caramelized balsamic red onions and figs. This one was also incredible! Mel's friend and her dad made a roasted butternut squash pizza. 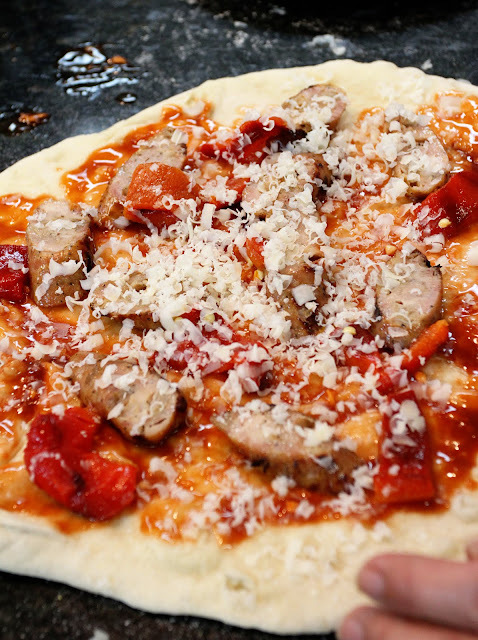 Who knew butternut squash would be SO GOOD on pizza? Kirk, you are a genius! And speaking of Kirk's genius-ness, you will not believe this next creation. Bacon topped with coarse salt and cheese, put directly into the oven on a pizza stone. After a few minutes of cooking, Kirk broke two eggs on top of the pizza to cook. It came out of the oven crispy, with the eggs still a little runny. He topped it with truffle salt and a light salad of arugula, evoo and lemon juice. I must say, I was not prepared for this pizza. It blew me away. but this pizza might just be the best thing I've ever eaten. Obviously everyone else in the entire class agreed and we had to make at least 4 more of these pizzas so we could all get our fill. The rest of the class made a few other pizzas and then we had the opportunity to play around with the ingredients and mix things up a bit. Chicken sausage pizza with roasted red pepper and marinara. Veggie pizza with tomatoes, black olives, asparagus and basil. Or how about butternut squash, asparagus, tomato chutney and Parmesan cheese. Kirk also showed us how to make a calzone using the pizza dough. This was was a marinara, asparagus, ricotta, herb calzone. The rest of the class was spent chatting and eating. We had to make sure we sampled at least one bite of every single pizza that was made (you know, for quality assurance purposes). Definitely not a bad way to spend the evening! Thank you Kirk and Kitchen Conservatory for such a fun night. I have a feeling we'll be back very soon (like next week). Probably shouldn't have read this post when I'm currently starving! It looks amazing! This looks like so much fun! I need to drag my parents and/or boyfriend to this sometime! MMM, gorgeous photos. I want all those pizzas!! Bacon and egg pizza?!?! I DIE. What a fun thing to do! I really want to take one of those classes. But first, I have to try butternut squash on pizza. Sounds awesome! WOW - I'm super jealous! We have been having pizza nights on Friday where we make our own at home but I have got to try them on the grill! Looks like a wonderful and delicious time! Glad you enjoyed it. This makes me want to take a cooking class soon too. It's been way too long. Wow, these pizza's look amazing!!! I'm inspired to try it on my own! That sounds like such a fun girl's night too! I officially want pizza for dinner! I also want you to know that I love your photography! That sounds AMAZING. I am such a pizza fiend - and I so wish we had a grill so I grill up a pizza right this second! Looks like such a fun way to spend an evening, too. Those pizzas look delicious too. That look like such a fun group activity! And those pizzas look delish!! grilled pizza is one of my favorites! love your unique flavor combo! Oh. My. Gosh. Those pizza's look DELICIOUS!! This sounds like so much fun! And the pizzas look delicious! I'd love to take some cooking classes. Your pictures are making me crave grilled pizzas. Yum! I can't wait to try these out! What a fun class!! When can I come visit and go to class with you? ?